While many people play Solitaire only on a computer, it was originally a card game played by one player and one deck of cards. The object of the game is to move all the cards from their original starting position to four piles. While the game's rules are simple, even the best players win only about 30 percent of their games. So new players should not feel frustrated if they lose at first. Shuffle the deck of cards until the cards are sufficiently randomized. Lay seven cards in a horizontal row. The first card should be face up, and the next six should be face down. Set a card on each face-down card. Only the card you place on the sixth pile should be face up; the others should be face down. Deal more cards using the previous process until each pile has a face-up card. These piles are called a "card block." Put the remaining cards in a pile above the cards you dealt, the card block. This pile is called the "source stack." Move all aces from the card block. The aces are put in a "suit stack." Eventually, you'll have four suit stacks at the top of the playing surface, one stack each for Clubs, Spades, Hearts and Diamonds. The goal of Solitaire is to move a card from the card block or source stack onto the suit stack. The cards on the suit stack must be arranged in ascending order. Thus, if you have the Ace of spades as the top card showing in the Spades suit stack, you must put the 2 of Spades over it before you can place any other spade in that stack. 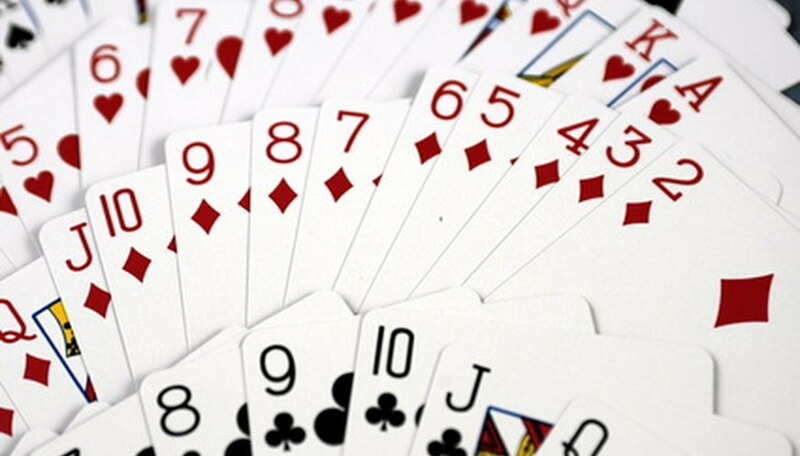 Flip over all face-down cards on the card block revealed by moving Aces or other cards to a suit stack. Throughout the course of the game, flip over all face down cards in the card block. Build card blocks by moving them onto one another. One card block can be moved onto another card block if the card block being moved is of an opposite suit and in descending order. For example, if the Queen of spades is the top card in a card block, you may move only a red Jack (the Jack of diamonds or hearts) onto it. Flip over three cards from the source pile. The top card from this pile may be moved down to the card blocks in the same fashion as card blocks are moved onto each other (by matching opposite colors and descending order) or directly onto the suit stacks. If any of the cards are not placed on a card block or suit stack, then place them on the bottom of the source pile in the same order in which they were flipped. Play until winning or losing the game. Continue flipping through the source pile and moving cards from the card blocks and source pile onto the suit stacks. You win the game if all cards are on the suit stacks. You lose the game if you cannot move a card onto the suit stack or if no possible plays would reveal another card in either the source pile or under a card block. A card block never disappears. A King may be moved from another card block or the source pile onto an empty card block. Play has no set order. You may flip over three cards from the source pile and then proceed to move around card blocks or vice versa. When all the cards in the source pile are flipped over face down, begin flipping over cards (three at time) anew. Don't get frustrated. Due to its random nature, Solitaire is not always winnable. An average game cannot be won, with the success rate (assuming perfect play) at about 35 percent.